There's a time for regrets. And two seconds after tumbling out of a plane with two miles of sky between you and the ground is not one of them. "Why on earth would you want to throw yourself out of a plane?" was a common question from my friends and workmates in the run-up to my skydive. And for everyone, I had a different answer. Because I was dared by Emily Rosselli, from St Cuthbert's Hospice, in Durham. Because it's a challenge. Because I'm a madman. Because it's for a good cause. Because I'm afraid of heights and I refuse to let my fear hold me back. Each answer was part true. 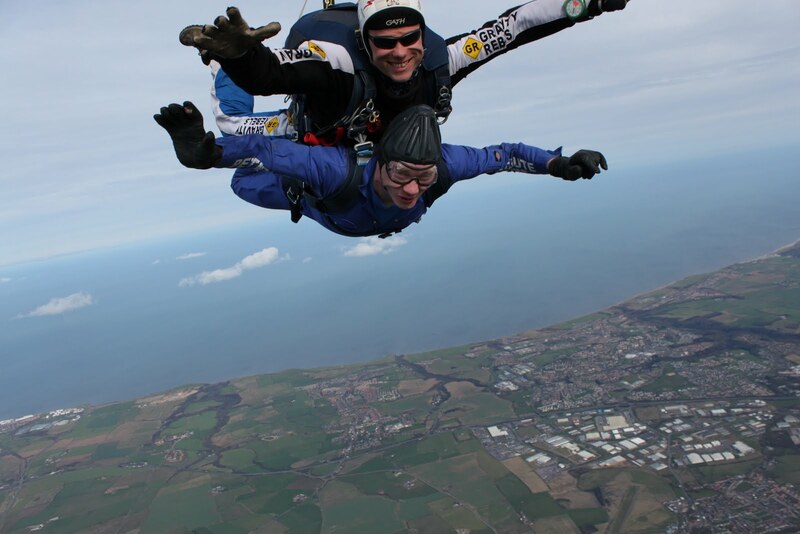 Each part-truth led me to Shotton Airfield, where the skydive took place. You couldn't really call it an adrenaline rush. My first planned jump, on October 2, was foiled by bad light. Further attempts were hit by high winds, heavy cloud, snow, ice, rain... people began to nudge me and ask me if maybe someone was trying to give me a message. But finally, six months to the day later and on my tenth attempt, I put on the jumpsuit, was strapped into the harness by Kev Dynan, the instructor who would be with me during the tandem jump, and up we went. As we took off, I expected my fear of heights to kick in. After all, I'm scared when I stand on a chair. The banter in the plane among the instructors and jumpers was nervous but kept a lid on things. It wasn't until it was time to jump that the nerves really kicked in. We were the last to jump, and seeing each combination of jumpers go ahead of us was terrifying. One minute, there they were, sitting on the step on the edge of nothingness and then, gone. Vanished. As we edged to take our place on that seat, I kept reciting in my head the things to do when we got there. Arms across chest. Lean head back. And then we got there, and I looked down. 11,000 feet down. To fields that were tiny squares. The A19's busy dual carriageway reduced to a fine, grey line. Little candyfloss clouds idling along below us, and fear in a knot in my stomach. Gone from my head were the instructions, until Kev pulled my head back to lean against him. A split second later, out we went. In that split second, all fear left me. Suddenly we were plummeting towards the earth at 140mph and all I could feel was pure exhilaration. For 30 seconds, we fell, with me screaming my lungs out. It's as pure a joy as you can imagine. And then, pop goes the canopy, the harness digs into you and the roar and the rush of the wind around you vanishes. Everything is suddenly peaceful, suddenly calm, and there you are, floating above the world, looking at it as never before. The ground comes closer, and closer, and all too soon, you touch down and it's over. Back to Earth. The end of one of the most amazing experiences I've ever had. So why did I really jump out of a plane? In 2005, my mother was diagnosed with cancer. She was a wonderful woman. Amazing. She always played down the things she had done in her life, but what she did was remarkable. She was a woman for whom the word no was a challenge, not a barrier. More than that, she was as warm and kind-spirited a person as you'll find. She lost her battle. But in the weeks leading up to that, the hospice helped both her and our family immensely. We were there for Mum until the end, and we couldn't have done that without the hospice. There's a time for regrets, but the hospice helped to make sure there were as few regrets as possible. So why jump out of a plane? So others can be helped by their local hospice in just the way I was helped. And for Mum, who I wish could have been there to see it happen. For more information about the hospice, visit www.stcuthbertshospice.com.